Apprehension lingered after each footfall. An impending sadness lurked in the shadows. Dread stalked tree to tree. Winter moccasins crossed the isthmus that divided the nasty thicket, then angled up the steep, slippery slope. Raspberry switches clawed and tugged at hunt-stained buckskin leggins on that cold, January day in 1797. The glade smelled damp; half-melted snow patches remained here and there. I gazed straight up. Dark, jutting webs of barren twigs and branches passed to my right and to my left. Beyond, smoky-gray clouds churned and roiled. When my eyes broke over the ridge, I paused, staying concealed behind a red cedar tree. On the crest of the next ridge, to the south a bit in the hardwoods, the brown canoe tarp and the exposed rafter poles of the little lean-to waited. As I stalked the tiny station camp, the center of my 1796 hunting adventures near the banks of the River Raisin in the Old Northwest Territory, emotions got the best of me. By choice that oak-covered ridge was my wilderness classroom, my laboratory for experimenting in my 18th-century Eden. My only regret was that class was not in session as often as I wanted—time travel can be an elusive partner. I dumped the Northwest gun’s prime, plugged the touch hole with a whittled sliver and leaned the smoothbore against the shelter’s extended ridgepole. I pulled the blanket roll from my shoulders and thumped it to the ground, just inside the humble abode. After removing my shot bag and horn, I checked the powder horn’s plug and hung them on a main rafter, next to the trade gun, a safe distance from the fire pit. 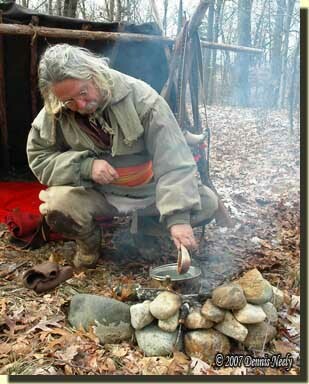 Reaching over the bedroll, I gathered up some of the dry twigs piled in the lean-to’s back corner. In like fashion, I grabbed two handfuls of brittle oak leaves from under the tarp’s edge. In a matter of minutes the soothing aroma of a fresh kindled fire eased my apprehensions. When I stood, I discovered a mature doe walking with the wind at her tail on the top of the next ridge west. The lean-to blocked her approach and kept her from seeing me. I smiled, rested my arms on the ridge pole and enjoyed her magnificent beauty. Over my shoulder, a faint plume of white smoke drifted upward, bothering neither her nor me. The time for deer hunting was long over. “Old Turkey Feathers” was loaded with shot in hopes of bringing a squirrel or rabbit to the camp, but that was not to be. It did not matter. The purpose of that sojourn was to pack up the tarp and close the station camp before the next winter snowstorm. In addition, the outing represented an earnest and long overdue attempt at christening a new brass kettle, purchased in the spring of 1796. In the months that followed the acquisition, every research project contained a reference to a kettle, be it tin, copper or brass. Each message heaped guilt on a traditional woodsman’s shoulders. I felt ashamed as my fingers broke up some venison jerk and sprinkled dried corn into the warming water, but there is never enough time. Yet, the doing seasoned the soup’s bland flavor with a rich sense of accomplishment. That midday jaunt proved bittersweet. For me, apprehension and sadness always accompany the breaking of camp, be it after one night or after an entire hunting season. Kindling a fire and blacking the brass kettle’s burnished sides was a consolation prize of sorts. The fox squirrels did not cooperate and the rabbits were holed up. The memorable prize of that adventure was simply enjoying the winter forest. But Nelson’s recollections also made allowance for other possibilities. He once observed the Native peoples “making” rice and wrote that “…they also roast some in old Copper Kettles…” (Ibid, 56) Adding to that reference, the list of supplies requisitioned by Meriwether Lewis for the Corps of Discovery included six “copper kettles (1 of 5 Gallons, 1 of 3, 2 of 2 and 2 of 1).” (Brandt, 428) Other woodsmen made similar notations. At a living history show, I happened upon a three pint, covered copper kettle made of heavy sheet copper and seamed with the classic overlapping box-edge joint. The reproduction included mushroom-shaped knobs riveted to the body, similar to those on original trade kettles. The price was fair so that kettle had to follow me home. I used it for a couple of years, until I heard rumblings about a high lead content in the “food safe tinning” used to line the kettle. I could neither prove nor disprove the rumors, so erring on the side of safety I stopped using the copper kettle for food preparation. These writings, coupled with trade inventories and existing museum artifacts led me to purchase a reproduction brass kettle that approximates the originals. The bale ears are cast, rather than folded sheet brass and the sides are a bit taller than some I have seen. The No. 0 kettle holds a little over a quart of liquid, and it was this kettle that I christened on that January day. Unfortunately, I don’t get to use the brass kettle as much as I would like, but that is my choice. With limited time, I would rather hunt than sit in camp boiling water for soup, which explains the procrastination, I suppose. But the journey down the path to yesteryear is one of discovery and learning. And by my estimation, I have barely begun. 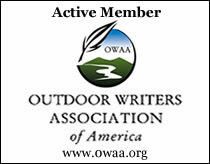 This entry was posted in Clothing & Accoutrements and tagged Dennis Neely, historical trekking, Mountain Man, Native captive, North West trade gun, Northwest trade gun, traditional black powder, traditional black powder hunting, traditional blackpowder, Traditional camping, Traditional Woodsman. Bookmark the permalink. Leaching is a real safety concern. 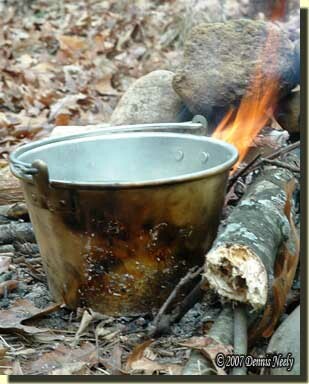 The two brass kettles I use are lined with “food safe” tin, if that description can be trusted. The copper kettle is lined with tin, also, but I read a warning posted on one of the forums that these kettles were made overseas and that the tin lining actually contained a higher than allowable concentration of lead. 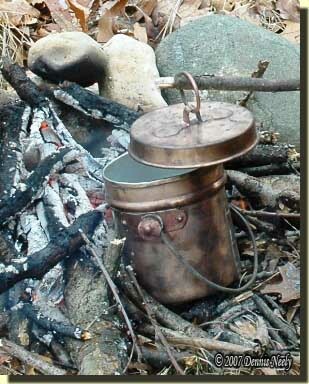 I try to limit my use of the brass kettles and now prefer to roast over an open fire, rather than boil a meal.